Clouds may exhibit one or more supplementary feature. But there is one cloud supplementary feature that seems so frightening, the tuba clouds. What makes this cloud phenomenon appear alarming? How does it occur? What does it say about weather? A deeper understanding of this cloud formation could actually be life-saving. Read on why. Tuba clouds refer to funnel clouds which are often associated with tornadoes. But these clouds are not tornadoes unless the funnel touches the ground. They become visible due to the moisture present from the main cloud. 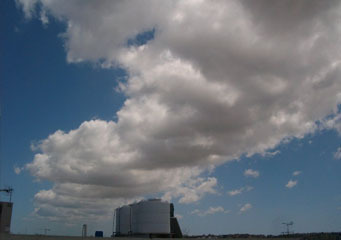 Tuba clouds often develop under thunderstorm-producing clouds such as cumulus and cumulonimbus. How do Tuba Clouds Form? These clouds form when the inflow of a supercell thunderstorm starts to rotate. The swirling of the inflow is caused by wind shear, a condition wherein the speed and direction of wind flow changes as the height increases. Wind shear triggers the horizontal spinning of air in the lower cloud level. The rising air in the updraft of the thunderstorm tilts the horizontally spinning air to vertical. As the speed of wind further intensifies, the warm downdraft wraps around the base of the cyclonic rotation which then strengthens the rotation, hence, creating the tuba cloud. At What Height do Tuba Clouds Appear? Cyclonic rotation usually develops at the middle cloud level since the atmospheric instability here is at its peak. Tuba clouds can therefore be found anywhere between 6,000 feet and 10,000 feet above the Earth’s surface. What do Tuba Clouds Look Like? These clouds exhibit a cone-like appearance projecting from beneath a supercell thunderstorm, though there are times that they are confused with virga. If it occurs over a body of water, the tuba cloud may appear white. If it is generated over land, it takes on a dark gray or brown shade. Typically, a tuba cloud is likened to a finger of cloud trying to reach the Earth’s surface. However, contact with the ground is often not made as the cloud disperses before this happens. How common are Tuba Clouds? This supplementary cloud occurs in many parts of the world; nonetheless, it is more common in mid-latitude regions like the United States. This is because warm air and cool air often collides in these regions making the atmosphere favorable for the development of severe thunderstorms. Tuba clouds are often visible during the tornado season which runs in the spring months of April to July, noting that the most number of tornadoes occur in May and June. Nevertheless, tornadoes may appear year round and occur in any state in the U.S. Observing tuba clouds can be a thrilling experience but you shouldn’t forget to put safety above everything else as these clouds may rapidly develop into a destructive tornado.